Darwin and his research on plant motion. In 1880 Darwin published The Power of Movement in Plants, a book describing his studies of plant movements. In his book, Darwin described various methods for observing plant movements. These methods were relatively simple and allowed him to conduct hundreds of experiments with numerous plant species in various locations in his home. All of Darwin's books have been translated into digital form and can be found on the web site of the British Library - Darwin. This page provides a procedure that attempts to reproduce one of the methods Darwin used to record plant movements. Most plant move so slowly to be beyond the attention span of most humans. To monitor such plant movement, Darwin realized that it would be beneficial if the movement could be amplified. To accomplish the magnification without the aid of sophisticated technology, he devised a simple approach that relied on using distance between a reference point, the part of the plant in question and the viewers vantage point. 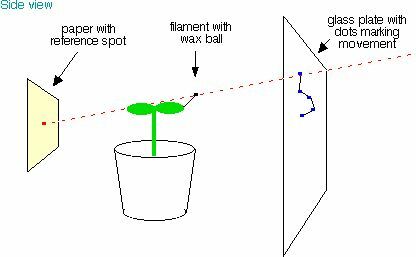 Darwin accomplished this by attaching one end of a thin glass filament to a plant with a small bead of black wax or a small paper triangle attached to the other end of the filament. Several inches behind the plant, he placed a piece of paper on which he drew a small dot. He then placed a piece of glass several inches in front of the plant. By viewing the plant through the glass with one eye and moving his head until the wax ball was in the line of site with the dot on the paper, he could then mark a dot on the glass such that it was in line with with the reference spot and the wax ball. He would then record the time next to the mark he just made. By observing the plant the same way at different times, it was possible to detect even very small movements by observing the displacement of the dots drawn on the glass. 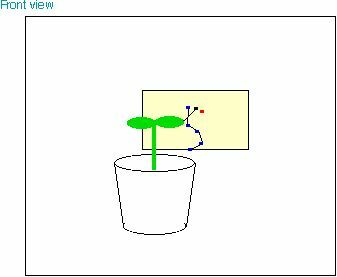 By changing the distance between the plant and the glass, it was possible to change the magnification of the movements. Using the description above and the following diagrams, which show the basic arrangement used by Darwin, it should be possible to recreate Darwin's experiment. However, instead of trying to mount vertical glass plates, we recommend using clear acrylic (Plexiglas) for safety. An alternative that works well and is easier to set up is a 10 gal or larger aquarium. With an aquarium, the plant can be placed inside and the reference dot marked on the back. The front glass can be used to mark the movements. By taping clear actetate to the front glass, you can remove the markings for easier analysis. The following image is an example of a Darwin tracing of the movements of an Dianthus caryophyllus flower-stem. The original figure legend (Fig 96, pg 233) reads "Dianthus caryophyllus : circumnutation of young leaf, traced from 10.15 P.M. June 13th to 10.35 P.M. 16th. Apex of leaf stood, at the close of our observations, 8 3/4 inches from the vertical glass, so tracing not greatly magnified. The leaf was 5 1/4 inches long. Temp. 15 1/2 o- 17 1/2 oC." 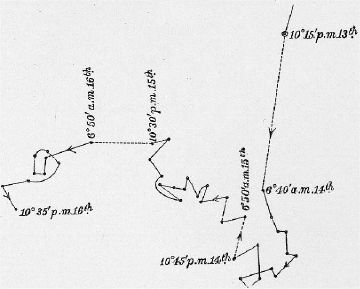 The figure shows the highly tortuous and zigzag course, together with some loops, pursued during 2 1/2 days. As the leaf continued to move all the time to the left, it is evident that the zigzag line represents many circumnutations.